i'm kind of suprised that no one has mentioned this yet because it's getting ever more important with the current times. we all know SEMA right? politicians are constantly trying to pass bills against older cars,SUV's,trucks and basically anything that is'nt a smart car. some try to instate rediculous MPG requirements,some try to make state emissions tests required and strict,some try to limit HP and some try to pass bills requiring us to trade in our jalopies for "incentives" towards a new electric hybrid. the sneaky snakes are'nt up front about it either. they'll tuck their new bill in with one that's sure to pass and hope no one sees it. they don't do it because they hate cars,they do it so they can throw it in everyones faces when elections come along. "remember me? i'm the guy who saved the world by scrapping anything made of metal.........hope you like your prius." SAN has saved us from a multitude of these so far and not only do they hawkeye bills for harmful personal propoganda,they also work with many federal legislators to pass our own proposals. if you love your car and love being able to put those glasspacks,4bbl's,turbos,nitrous and headers on then you should check out the site and see what you can do to help. The SEMA Action Network is a nationwide partnership of car clubs, and individual enthusiasts (like you) who work together to impact legislation that affects car and truck hobbyists of all kinds. By joining the SAN you will receive up-to-date alerts on hobby-related legislation in your state and across the country. Best of all – it’s free. Last edited by bondo; 06-15-2009 at 11:48 AM..
Huh, Ive never heard of SAN before, but I'm a member now! Thanks Bondo! Looking over the site now, its crazy some of the things they are trying to outlaw. I was discussing some of the things I read on the S.A.N. website with a friend of mine, when something occurred to me. America is based on freedom. The freedom to do what we want, when we want. We can do anything as long as it does not interfere with another mans freedom. Am I right? Limiting horsepower on automobiles and limiting certain accessories does nothing but limit our freedom. So what if a car has 400+ horsepower, whos freedom is damaged because of that? Whos freedom is damaged by someone driving a car that is more than 25 years old? Whos freedom is damaged if someones music can be heard from more than 25 feet away? Whos freedom is damaged by another man driving a car with a turbo? It really bothers me that politicians are trying to destroy my career before I can even start it! Thanks to these people, the $34,000 I spend to go to school for a career in the automotive field may be for nothing. Been apart of SAN for a year or so, when ever I got active at the 67-72 Chevy site. 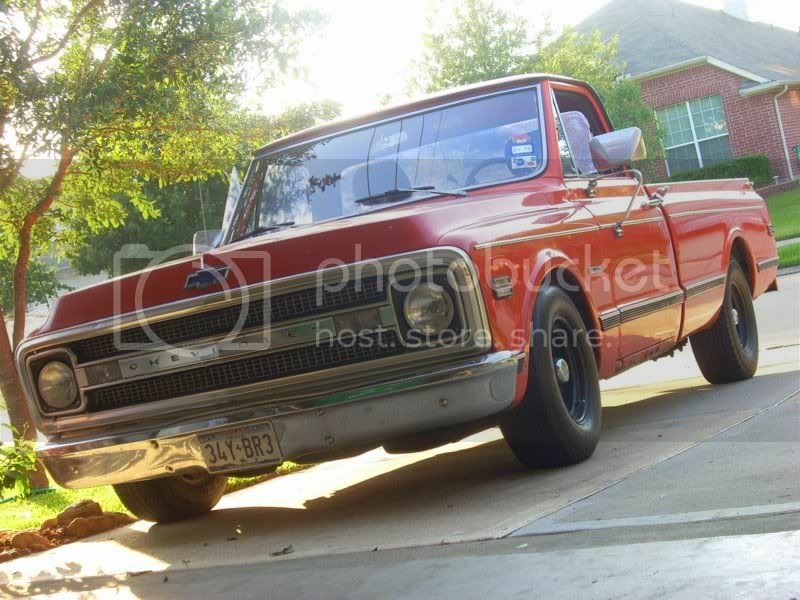 But more ranting later, off to go drive 50 miles or so non stop for a few hours delivering pizza in a 300 hp carbureted pick up truck. My eyes have always been open to the sleaziness of politicians, I've just never thought of hot topics within the automotive world. I've been aware of SEMASAN for a while. It's useful, you can look up laws in your area. Been doing research regarding NOS laws, it's a useful resource. Hybrids are a myth. They are just around so you can get a tax credit and feel better about yourself. The process of making them pollutes more than the buildign, and driving of even a Hummer H1. Right now I have two V8 Chevy trucks sitting in my driveway, and I love them! The only reason we have an inline four in our garage is because my dads girlfriend needed a cheap car after she got divorced. Tex, AJ.... I agree. Politicians are limiting so many things nowadays. You now have to pay $7,000 if you buy a car that gets under 20 MPG, and can get up to $3000 if you buy a hybrid, turbo diesel injected, compressed natural gas, or propane car. That all good for the guys in Cali, but those who needs trucks, and who live in the countryside, it hurts them the most. SEMA has always been soemthing I want to see. Its the best of the best, all invitational type of thing that I admire. Actually, the tax rebate is only good for the first 6000 or so cars. You no longer get rebates for the Prius, civic or accord hybrids. Whoah whoah, guys go get educated. There is not tax for non-hybrids. The guzzler tax applies to certain sports cars for the most part. And the cash for clunkers bill that a few of you are refering to is something that is PURELY VOLUNTARY. Just because a vehicle fails inspection does not mean it's required to be traded in. That's nonsense. This system has been in Texas for years. There's no lack of classics. I know. Thats what I was trying to say. But I just checked and apparently it doesn't apply to some SUVs. i think i may have been a bit misleading with this. some try to pass bills requiring us to trade in our jalopies for "incentives" towards a new electric hybrid. the key word in the quote above is try. there is,like texan mentioned, a "cash for clunkers" program that is completely voluntary. what i was reffering to was about a year ago some duckbag from iowa or utah or something like that decided to try to slip a proposal in with another bill(state law) that would REQUIRE owners to trade in their non-running jalopies for so called "incentives" towards a hybrid with possible fines for anyone who did'nt. this bill also included junkyards so my guess is that that politician was probably into land development on the side and was trying to clear land to buy. i'm glad to see that this thread has already gotten a few new members. i'm not one that really believes in organizations for the most part but this one actually does make a difference.